The Legendary Hotel Sovietsky, founded in 1951, is located in the heart of the culture, fashion and business world of Moscow, a short distance from the major exhibition centres, museums, art galleries and shopping outlets. It is one of the most well-known old 4-star business club hotels in the city. The recent renovations have made the hotel even more welcoming and fascinating. 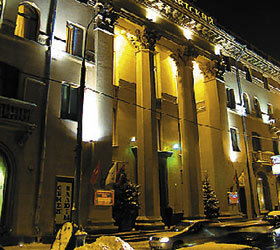 The Historical Hotel Sovietsky offers accommodation in 106 spacious rooms and Suites. All rooms are air-conditioned and finished to the highest residential standards. Some rooms and apartments overlook the quiet courtyard with a summer terrace. The hotel lobby features a magnificent marble staircase with high columns, crystal chandeliers and paintings on the walls. This decor opens onto the lobby restaurant where the sounds of live piano and harp entertain the guests at healthy and rich buffet breakfast and accompany the afternoon tea. The legendary Yar restaurant, founded in 1826, is a special pride of the hotel. Luxurious interiors of the Yar main hall and mirror room, romantic atmosphere and extravagant night show "Russian Ball at Yar" make it a perfect fine dining restaurant offering cuisine which is true to the best European and Russian traditions of hospitality. The range of services is completed by an indoor private parking, Wi-Fi Internet access, concierge and 24-hour room-service, complimentary temporary membership to a nearby health club.